Height: 6′ 0″ Weight: 175 lb. Acquired: Signed as a free agent on April 28, 1980. George Cappuzello , the man who allegedly was on an ice cream and doughnut diet during Spring Training in 1981, appeared in just 18 games that year for the Tigers. 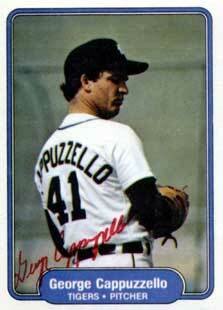 Originally, Cappuzello was drafted by the Tigers in the 27th round of the 1972 amateur draft. He spent six seasons in the Tigers’ system before being traded with minor leaguer John Valle (minors) to the Reds for Jack Billingham on March 6, 1978. He returned to Detroit after being released by the Reds in April 1980. After his March 1982 release from the Tigers, he appeared in 17 games for Astros, pitching in his final game on Aug. 5, 1982. By the way, he turns 57 today.